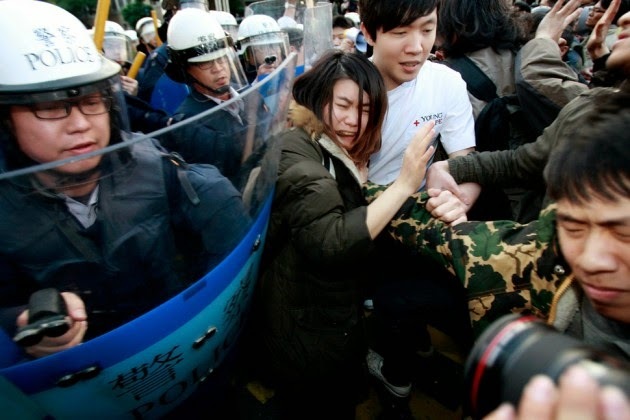 After the events in Ukraine over the past month, the news from Taiwan feels eerily familiar. The turmoil takes place in a small country that has spent years living uncomfortably in the shadow of a major power—one with ambitions to recover territory lost during a humiliating period of weakness. The small country has a weak economy, and the government decides to push through a controversial deal to tie the small country’s prospects closer to its powerful neighbor. That move sparks outrage against the unpopular president, who has already faced criticism after the jailing of a popular opposition leader on corruption charges. The protests grow, turning violent as the embattled president orders security forces to break up the demonstrations. Taiwanese President Ma Ying-jeou is not former Ukrainian leader Viktor Yanukovych—Ma, for one, doesn’t have an opulent home with seven limos, a private zoo, and a life-size galleon on a man-made lake—but as political unrest grows in Taiwan, the similarities between the two are striking. Just as Russians considered Crimea to be territory unjustly separated from Mother Russia, the Chinese government has insisted since the days of Mao Zedong that Taiwan is an inseparable part of the People’s Republic. Both the Ukrainian and Taiwanese economies have suffered from disappointing growth, especially compared with more dynamic neighbors, and just as Yanukovych wanted to cement closer ties with Russia, Ma has been promoting a deal to liberalize trade and services with China. Yanukovych jailed former Premier Yulia Tymoshenko for a seven-year term, while Ma’s predecessor, former President Chen Shui-bian, is serving a 20-year sentence after being convicted on corruption charges in 2009. Now the Taiwanese leader is quelling a student-led revolt against his attempt to ram through the legislature the services trade pact signed with the mainland last year. While lawmakers have dragged their feet on approving the agreement, Ma has called it a vital step in his efforts to revitalize the Taiwanese economy, which last year grew 2.95 percent, down from 3.85 percent in 2012. The deal would open banking, brokerages, e-commerce, and other sectors of the Taiwanese economy to investment from the mainland. Critics say Ma’s government has reneged on a promise to do a line-by-line review of the agreement. The president isn’t compromising, and in the early hours of Monday riot police fired water cannons at protesters to clear them from the building in Taipei that is the headquarters for the cabinet. Police arrested about 60 people, Bloomberg News reports, and a total of 110 people—demonstrators and police officers—were injured. But the students still are occupying the legislature. Fortunately for Ma, the Taiwanese economy isn’t as bad as Ukraine’s. Taiwan’s unemployment rate was just above 4 percent in February, down from about 6 percent in mid-2009. The picture for the economy this year is looking slightly better than it did at the end of 2013: Last month, the government raised its forecast for growth in 2014 to 2.82 percent, compared with an earlier forecast of 2.59 percent, and the government expects exports to increase 3.33 percent, better than the earlier forecast of 3.07 percent. With the occupation of the cabinet headquarters over, Ma seems to have the upper hand for now. But Yanukovych probably thought he was in control, too.